Turn into an engineer with one of many DIY robotic arm kits. There is no question that robots are a huge part of the future. They are performing jobs that we never thought possible, all thanks to scientists and engineers who have been hard at work in dark labs working, programming, creating, testing, designing, failing, and succeeding. There is also no question that kids love robots. They love the idea of robots. Just ask a young child what their robot would do and they will go on and on and on…and on about the many things their robot would do. Their robot will fly, hold up a heavy object, walk, dance, answer questions, build, create, and more. Getting kids to sit down and build a robot, however, can often be an entirely different task. They want it done now. Yet they don’t have the skills to actually build their robot, let alone a small piece of what might be their robot. To build a robot you need a lot of different skills, not to mention parts. We really lucked out when it came to ordering the Lewan Soul 6DOF robotic arm from Amazon because it was a kit that had all the parts. It even has the software preprogrammed onto the chip you will install, meaning once you build it, you can play with it. I’m just going to come out and say it: I LOVE this robotic arm. It has already taught us so much already after only using it for a few days. What our 6DOF robotic arm has taught us. A review of the benefits. We haven’t had too much of a chance to play with our robotic arm as of yet – just some afternoons using the servo motor control, but no programming as of yet, even so, I can’t tell you how much I love this robotic arm already. Our goal was to have our two girls build the robotic arm under supervision, but they were the ones doing the work. The Lewan Soul 6DOF robotic arm has an easy to follow YouTube video that walks you through putting your robotic arm together. Having the girls watch the video, find the parts, orient them, and then secure the parts as shown was a great lesson in careful execution, attention to detail, and spatial awareness. Once they had the right parts on hand they also learned simple mechanical skills – you know, those skills we take for granted as adults. Skills such as being able to name nuts, bolts, and screws as well as determine at a glance what nuts go to which bolts. By the end, they even knew what size bolts to use based on hole size in the robotic arm. Righty tighty, lefty loosey. I probably said that a hundred times over the two days we took building our robotic arm. In the beginning, I had to physically show them which direction to turn the screwdriver, by the end I could give them reminders, or mention to think about the way a clock turns. They learned how to thread a nut. You might be wondering how that could be an acquired skill, but we all have to learn these things at some point, and when you are under 8, figuring out how to actually get a nut to thread onto a bolt can be tricky. This part probably took the most perseverance of any other part. I can certainly say it was painfully difficult to not just start the threading for them each time, but I didn’t, and we got through it. The learned teamwork. I don’t know about your kids, but my kids are always wanting to be the one doing things. During this project, they learned how to better take turns, and how to help each other out when the other was having a difficult time finding the right piece or getting something put together. They saw how their work paid off. This was probably my favorite part of the whole project. 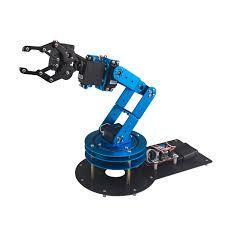 We spent two afternoons putting the robotic arm together and when we plugged it in it all worked great. It was really nice that they could instantly use the controller in servo (motor) mode and control the robotic arm to pick items up. In the future, we will learn the how to program the arm and create our own obstacles or tasks to do with the arm as robotic challenges, but for now, we are all just happy playing with it. We love our 6DOF robotic arm! It is a sturdy all-metal construction that feels unbreakable (although I absolutely know it is breakable). The instructions were clear and easy to follow – so easy that a 4 and 7-year-old were able to put it together. It has loads of options for how you control it, and it is fairly cost-effective. If you can’t tell from the above review, we would give this 5 stars!